Timothy Good is an authoritative researcher in the field of Ufology. He has been collating reports, and authoring books on the subject, for as long as I can remember. His crowning glory was 'Above Top Secret', a book which made significant inroads into the mass consciousness regarding the UFO phenomenon and our collective governments' reaction to it. This latest book represents a comprehensive overview of UFO sightings by trained observers. The majority of these are military in origin, gleaned from first-hand accounts and official records. The sightings are set out chronologically, giving the reader an insight into how the military's reaction to UFOs has changed over the course of some 75 years. An unsettling pattern quickly emerges. Time and again UFOs are observed as solid craft exhibiting an unearthly ability to manoeuvre in our skies (and sometimes in our seas as well). They are tracked on radar, and witnessed simultaneously by often large groups of military men. Physical evidence is reported to have been collected. Then, a short time afterwards, a debriefing occurs, conducted by operatives from an intelligence agency, or a special branch of the armed services, and the evidence is removed, never to be seen again. The witnesses are sworn to silence, often threatened in the process. Official military logs of significant UFO sightings are altered as if they never happened. Only explainable sightings are paraded before the media, to give the sense to the public that there is nothing mysterious about the UFO subject. A disinformation war is underway. A second, perhaps more unsettling pattern emerges through the book. UFOs are capable of destroying our aircraft, and often do so. There appears to be a cold war going on between the Earth's various military bodies and these visitors from who knows where. Sometimes that cold war hots up, mostly as a result of aggressive actions by our air forces, but sometimes initiated by the UFOs. It becomes clear that over time our forces have been gradually overcoming the technology gap, and have become more effective at repelling UFO infiltration into our skies. Our military action (primarily executed by the all-powerful US) is driven by the need to regain control of the skies, attain exotic technology through shooting down UFOs, and simultaneously hoodwink the general public into believing that none of this is even happening. Which leads us to the third unsettling aspect of this book. These tactics, in use for about 60 years, have worked. If the US military has failed to regain control of our skies, it has more than compensated for that through its control of the public's perception of the UFO subject. I think that 'Need to Know' is one of the finest books ever written about UFOs. It is authoritative, eloquently written, engaging and ultimately compelling in its content. Its concentration on the interaction between UFOs and our military installations and forces draws the reader to a matter of tremendous significance, perhaps going to the heart of the whole subject. Countless servicemen have encountered UFOs, and have been ordered to intercept them, or even shoot them down. Sometimes these action have been calamitous, with loss of life on a surprisingly large scale. Yet, the military authorities continue to order their servicemen into action against a force whose capabilities are clearly well beyond our own. There is no training, and thus no insight into the real level of threat to the frontline forces facing this unknown and unquantifiable threat. Prospective armed forces pilots should read 'Need to Know'. They should make themselves aware of the dangers they could potentially face when ordered to intercept UFOs. Tim Good documents countless incidents where UFOs buzz aircraft, causing catastrophic instrumentation failures. Some aircraft simply disappear, others lose power and crash, causing significant loss of life. These incidents aren't just based on hearsay and rumour, but are compiled from first-hand reports and backed up by official documentation and records, where such material continues to exist. I have often observed that the general public has a higher regard for the individual servicemen of our armed forces than their political masters. At times of war public dissent is discouraged by the authorities by reminding us through the media that the morale of our troops on the ground is at stake. This positive regard for our soldiers, sailors and pilots is absolutely correct. Yet, when these same soldiers, sailors and pilots report encounters and incidents with UFOs that attitude reverses entirely. The media discredits the reports, and the military comes down hard on the servicemen concerned (after carefully gleaning as much information from the reports as possible). We, collectively, believe the authorities over the individual servicemen. Why? In all other cases we would side with the servicemen, and be cynical of our government's overtures. Tim Good's book offers a powerful argument for UFO reality, and presents its evidence in a clear and compelling manner. Frankly, I don't see how any free-thinking person could read this book and not be shocked by it. 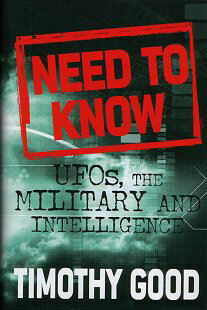 Subtitled: "UFOs, The Military and Intelligence"